My husband, Mark has his eye on my Parker IM Pen. 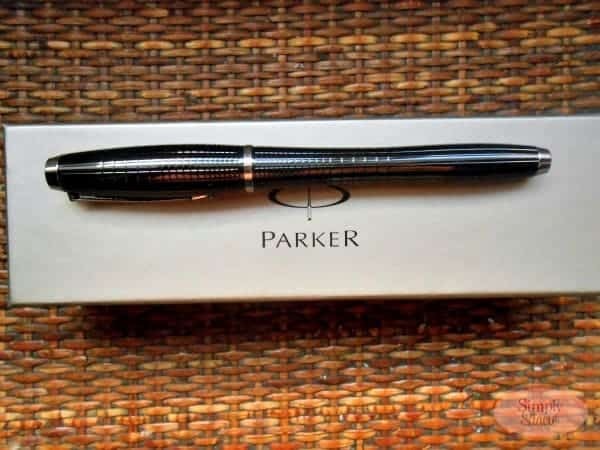 Therefore, I have decided that presenting him with his own Parker Urban Pen would be a wonderful gift idea for Father’s Day and hopefully keep him away from my favorite pen. Parker IM Pens makes writing a luxurious experience and is very proud to be celebrating their 125th year anniversary! There are lots of fabulous styles to choose from and colors such as black, metallic and more. Mark loves the Parker Urban Premium Ebony Pen with a stylish black metallic finish! He commented on the ergonomic curved design with a bullet shape that he said makes writing a pleasure instead of a chore. It is surprisingly lightweight and comfortable to write with even for longer letters, reports etc. This pen is designed for durability, functionality and is the perfect accessory for men who like to make a statement. I “borrowed” his pen to try it out and really like the smooth writing that I have come to appreciate with all Parker Pens. I never have to worry that the ink will skip or bleed into the paper making these the most extraordinary pens. 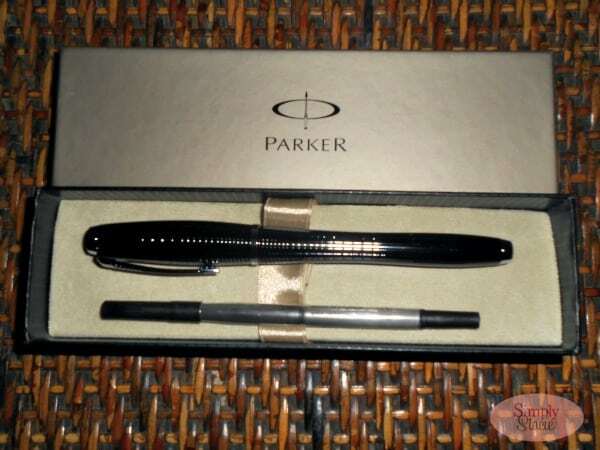 Parker Pens make great gift ideas and it will come in an elegant gift box. If you are searching for the perfect gift idea this Father’s Day then I highly recommend checking out Parker Pens such as the Parker Urban. You can also choose from additional styles including fountain pens, ball point pens and even roller ball styles. Parker Pens are attractively priced and available for purchase with a suggested retail price ranging between $32 and $100. You can purchase Parker Pens at Reids, Basics, Wallacks, Boutique Du Stylo and many other fine writing specialty stores throughout Canada. Are you ready to select the perfect pen? Head over to visit parkerpen.com to check out the entire collection of Parker Pens. Probably my husband – he uses one all day. I would give this to my brother whom I can’t see and haven’t seen for about 3 tears because he is in a nursing home due to healthe reasons and I love him so much! Definetly would give this to my husband. He deserves the finest life has to offer. I’d give this to my dad. This would go to my husband. My Dad’s been gone for a long time now, so I would keep the pen for myself! I would give it to my son. He has a collection of pens. Well, I’ll say my husband, but who are we kidding? I’m a pen hoarder! I’d like to give it to my husband for work. My older brother would really love this pen! I would give it to my brother. He can always use a pen. My fiance who works so hard!! My husband. He keeps taking mine and I have to go looking for it. This is a great place if you are in the Newburyport area. Perfect for kids 1-7. Lots of things for the kids to do and a great place for Mommy to relax a bit and let the kids play. I’d give this pen to my husband!